More and more women are starting to drive trucks, but there are still quite a few that are just along for the ride. If you're going to be out there for the long haul, instead of just a few days, you may want to be prepared. Organize the area that will be "yours" on the truck. You'll probably get one closet with a cubbyhole on top (That's all I got anyway!) 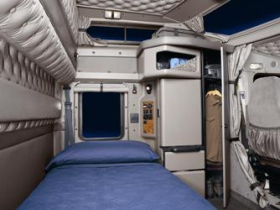 Space in a rig is at a premium unless you're lucky enough to have a truck with what I call an "apartment" sleeper. 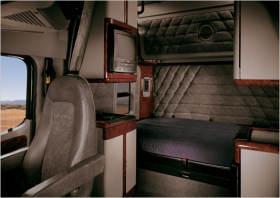 Most trucks have a standard-sized sleeper that is roomy enough for one person, but it can be a tight fit for two if you don't organize. Stackable containers that were flat squares or rectangles with tight-fitting lids served me best because I could stack them on the floor of my closet while my clothes were hung on the rod. The cubbyhole above my closet held other stuff that was odd-shaped or wouldn't go into a container. I used containers that were just large enough for the things I had to put in them. Extra space in containers is wasted space on a truck. The following is a list of the containers I kept along with ideas of what may be taken to make life a little easier during your journey. Shower bag (I actually used a canvas bag for this) - This was my most important thing on the truck. You will need this every time you want to freshen up or when you stop for a shower. Make sure that you leave enough room in the top of the bag for your change of clothes. This bag is where you'll keep shampoo, conditioner, lotion, toothbrush & paste (or denture cup, cleaner and adhesive), liquid bath soap (or bar soap in a travel container), razor & blades, powder, deodorant, cologne, hair spray or gel, and a washcloth just in case (you never know when you may need it). I also kept a can of Lysol (cheap brands do the same job) in my bag. I'd spray the shower, toilet, sink and most of the floor when I first go in for a shower. This way, it would have time to dry while I disrobe and unload my shower bag. The reason I did this was simple. Most truck stop showers are pretty clean, but there are still germs lurking around. I ended up getting Athlete's foot fungus...and it ain't no fun! Using the Lysol prevented it from ever happening again. For freshening up, I kept a container of baby wipes or wet wipes in my shower bag as well as makeup remover or cleansing cream (comes in handy when you don't have water or a sink). These days they have makeup-remover towelettes which are great to use on the road. Makeup Kit - Take just what you need/use the most in makeup. Also include (if you use them): nails, nail glue, 2 or 3 bottles of polish, clippers, polish remover, nail file; contact lens case and solution; a few hair bands or clips. Remember to use a container or case that is just big enough for what you have to take. You can probably throw some jewelry in this case as well. Just be careful with your best stuff. I removed 2 silver rings in a rest area once...then, walked off and forget about them until we were too far to go back. Of course, we know that someone else is wearing my rings! My bad! Things to Do Kit - notebook and pens, personal diary, puzzle books, books to read, needlework projects, hand-held games, etc. Keep in mind that you'll be doing things while rolling down the highway, so be sure that you're not doing something that could hurt you if the truck hits a bump in the road, especially if you don't have an air-ride seat! I had to buy a thimble when I was doing needlework. It didn't take long for me to learn that lesson! Camera Kit - If you like to take pictures, then you probably already have a bag with all your camera gear in it. If not, get a container and line it with hand towels to protect you camera from unexpected bumps and jolts. Basically, take only what you need and organize it so that you're not taking up a lot of space, yet you have easy access. You're not done yet! Move on to Women on the Road - Preparing for the Trip - Part 2!